Get this ancient game at Amazon. 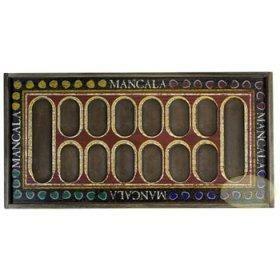 Learning Mancala rules will allow you to participate in one of the oldest strategy board games in the world. It's a great game to play when bored and a game that keeps you thinking. Each player has six small bowls and one larger one; these may be actual bowls or simply depressions in a wooden game board or similar surface. Players start with a set number of Mancala stones in each bowl, requiring up to 60 stones for a game. You can buy 2-player and 4-player game boards to enjoy Mancala. However, it's also possible to make a Mancala board out of household objects like egg cartons or even to play it with holes dug in dirt or sand. Along the same lines, you can buy manufactured glass Mancala stones, or use seeds, beans or rocks to play. Place three stones in each small bowl. The larger bowl is called the Mancala and remains empty. At the start of each turn a player picks up the stones in one of her small bowls. She then places one stone in the small bowl to the right, one stone in the bowl to the right of that one, and so on counter-clockwise around the playing area. The player should place a stone in her own Mancala but not in the opposing player's Mancala. 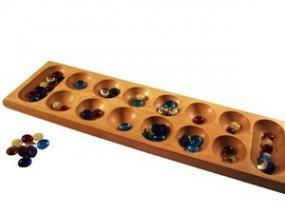 The object of the game is to be the player with the most stones in the Mancala. From such a simple beginning come numerous variations, making subtle changes to the basic gameplay of Mancala. There are a few common options, or you can pick and choose elements from alternate Mancala rules to create your own specialized game. Just make sure all players agree on the way you're playing. Start the game with four stones in each small bowl. Change the number of small bowls. Play the game with four-people, following all other rules for dropping stones. The game ends when one player clears his small bowls. His opponent get to claim all of the stones left in play. The game ends when one player clears her small bowls. She gets to claim all of the stones left in play. When a player drops his last stone in the Mancala, he gets to take another turn. When a player drops her last stone in an empty bowl on her side, she takes the stones from the bowl opposite and places them in her Mancala. Do not drop stones in the Mancalas. When the last stone is dropped in an opponent's bowl, the player may take the stones if there are two or three total. If there is any other number, the stones remain in the bowl. If the second-to-last bowl has two or three stones, those stones are taken, too. The same rule applies to all previous bowls on the opponent's side until the original player either comes to a bowl with more or less stones or arrives at his board. If the stones from a bowl allow for more than one lap around the board, skip the bowl from which they were taken. The game ends when one player's bowls are empty and the other player can't make a move that would drop stones in the empty bowls. The other player keeps his remaining stones. If both players are unable to make a move, they may split the remaining stones or ignore them in the final count. This game requires more stones than other variations, and you may wish to use smaller objects to make sure they will fit in the bowls. Start the game with six stones in each small bowl. Players may choose to drop stones in either direction. If the last stone is placed in a bowl with other stones, the player picks up all of the stones and drops them in the opposite direction. This continues back and forth until the last stone is dropped into an empty bowl. If the empty bowl is on the opponent's side, nothing happens. If the last stone is placed in an empty bowl on the player's side, he places that stone and the stones in the opposite bowl in his Mancala. However, the player may not take the stones from the opposite bowl if no stones were added to it during that turn. When there is another empty bowl next to the bowl where the last stone was dropped, the player may also take the stones in the bowl opposite it, going down the line until he reaches a bowl with stones on his side or an empty bowl on his opponent's side. In order to take a turn, a player must start from a bowl with more than one stone. If this isn't possible, she must skip a turn. At the end of the game, players keep the stones remaining in their own bowls. Multiple rounds of the game are played until one player has four stones or fewer left.